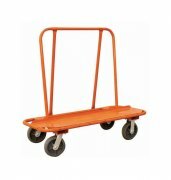 This high quality Drywall Cart will help to move the job along! Designed to haul full capacity loads with greater maneuverability and stability. Your cart comes with heavy duty 8" casters.